It was an email that reportedly resonated with many Snap employees. 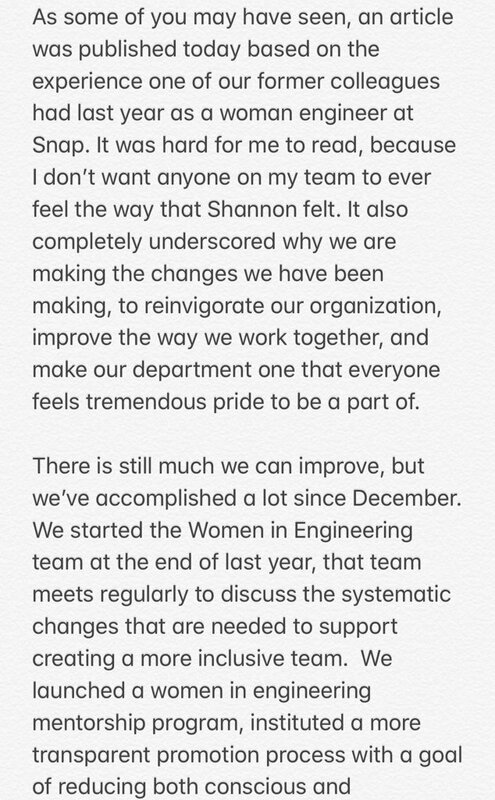 In the email response from SVP of engineering Jerry Hunter, Hunter says that the email was difficult for him to read because he doesn’t “want anyone on my team to ever feel the way that Shannon felt,” which underscores why Snap has made a number of changes since last December, including the start of a Women in Engineering team that meets regularly to discuss changes that are needed to make a more inclusive team, he says. “We will continue to take important feedback like hers to heart, and as the last few months should show, we put those learnings in action,” Hunter wrote.